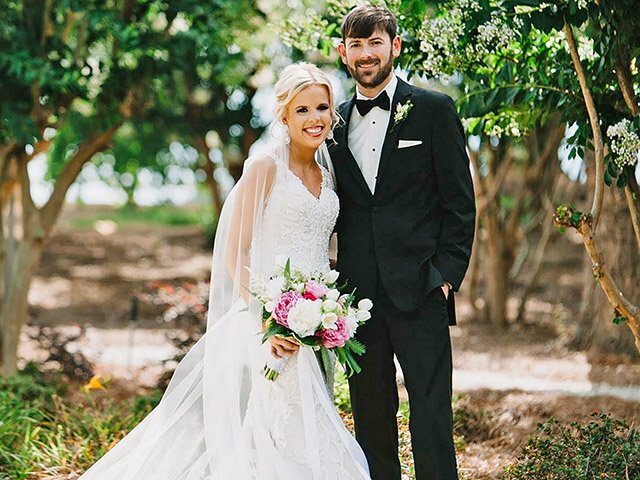 Updated: Oct. 21, 2018, 12 a.m.
Millie Marie Lee and Brad Vernon Boykin were united in marriage on June 16, 2018, at White Oak Farm near Augusta, Georgia. Dr. William Perry performed the ceremony and Dr. Torian White gave a blessing to the couple. The bride is the daughter of Dr. and Mrs. Stan Lee of Statesboro and the groom is the son of Jill Boykin and Mike Boykin, also of Statesboro. The wedding took place on the lovely grounds of White Oak Farm. The focal point of the ceremony was a beautiful iron circular wedding arch adorned with vibrant pink and white peonies, hydrangeas, snapdragons, roses and tulips. Lush tropical palm leaves and greenery completed the arch. As guests arrived, they entered the center aisle that was flanked by twin arrangements that mirrored the florals in the arch. Given in marriage by her parents and escorted by her father, the bride wore a lace gown with an illusion back. The sheer beaded lace adorned the V-neckline and hand-beaded lace appliqués continued throughout the gown. The illusion back was completed with hand-placed lace and covered buttons with a scalloped cathedral train. The veil had a beaded border and was encrusted with crystals and pearls. The bride carried a hand-tied bouquet of vibrant pink peonies, white peonies, white tulips, tropical palm leaves, fern and hostas. Kittie Lee of Statesboro served as her sister’s maid of honor. Leslie Braun of Statesboro was her matron of honor. Bridesmaids were Abbey Baxter of Dallas, Texas; Dr. Dani Lee of Statesboro, sister-in-law of the bride; Paige Navarro of Statesboro, sister of the groom; Laura Stubbs of Augusta; and Jordanna Williams of Swainsboro, Georgia. The attendants wore black crepe strapless floor-length gowns. They carried hand-tied bouquets of soft pink peonies and tulips, fuchsia roses and green hydrangeas. Mike Boykin served as his son’s best man. Groomsmen were Joel Arrington of Americus, Georgia; Dr. Andy Lee of Statesboro, brother of the bride; Beau Leyse of Albany, Georgia; Joe Quenga of Arlington, Virginia; Chip Stephens of Bowden, Georgia; and Ben Wooditch of Savannah. Lilly Kate Braun of Statesboro was the flower girl. Jackson Lee of Lynn Haven, Florida, cousin of the bride, was the ring bearer. Program attendants were Maggie Lee, Laynie Lee and William Lee, all cousins of the bride. Daniel Navarro provided music for the ceremony and Pat Chandler directed the wedding. Following the ceremony, the bride and groom and their guests enjoyed dinner and dancing at a reception, also at White Oak, given by the bride's parents. The couple honeymooned in Barbados and now resides in Brooklet.